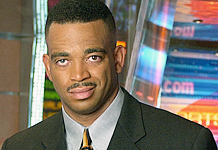 *Sad news about popular ESPN anchor Stuart Scott. On Monday he revealed via his Twitter account that he has started his chemotherapy. It was announced by ESPN earlier this year that Scott will need to go through more chemo for an unspecified cancer. We wish Stuart Scott all the best. Take care Scott you are in my prayers. It is definitely all in the attitude. If you give up or have a defeatist attitude, you’re done. Yes, when it’s you’re time, it’s your time but, you don’t have to go out early! I’m rooting for you brother.